How do I report problems I find around campus, i.e. : standing water, irrigation, down tree limbs, broken benches, etc.? How do I get approval for signage? What activities on UCF natural lands requires a site permit? Where are the UCF Zones located? Where can I find information regarding the next prescribed fire? Are we a Tree Campus USA? What are some of the current projects? What should I do when I see a gopher tortoise? What type of wetlands are found on campus? What is the UCF Land Management Program? What management techniques are employed on the campus natural lands? Where can I find more information about the natural resources of UCF? Are there any nature trails located on campus? Are there available volunteer positions? Where can I find information regarding smart landscaping in Orange County? How do I request a bike rack installation? What are some of the guidelines to follow while riding a bike on the nature trails and on campus? Prescribed burns require a permit that can only be obtained if weather and atmospheric conditions are favorable; thus we cannot schedule the burns ahead of time for specific dates. Therefore, it is difficult to plan for these burns. The website ticker on LNR’s Home page is updated regularly to keep you informed about our prescribed burn activities. Requests to place temporary outdoor signs on campus grounds must be submitted via the approval process outlined on the LNR website. Click here for more information. How do I report a problem regarding irrigation or foliage? If you see a problem, please report via the Create a Work Request on the Facilities Operations website. At any given time, there are numerous on-going projects that are being worked on throughout the university campus. Our website keeps the community informed on all work being done through the Landscaping and Natural Resources division. Please visit the LNR website for more information. The UCF main campus is sectioned off into landscape zones so that our ground crews can more effectively maintain the landscape. A map of the zones is here. In addition, the Integrated Pest Management (IPM) program uses zones to schedule their work. You can access that map here. Who do I notify about bugs in my dorm/my classroom/my office? If you see a problem, please report via the Create a Work Request page on the Facilities Operations website. Who do I contact to report about a down tree or large branches? Down trees and branches can create a hazard. Please report via the Create a Work Request page on the Facilities Operations website. Who do I call about large amounts of standing water on campus? If you see standing water, please report via the Create a Work Request page on the Facilities Operations website. UCF encourages teaching and conducting research on its natural lands. To protect the campus resources, site permits are required. Please visit the Natural Resources Site Use information page on LNR’s website. Gopher tortoises are a keystone species in the scrubby and flatwood habitats, meaning they create livable habitats for many other creatures when they dig their protective burrows. Over 100 commensal species also call these burrows home. Gopher tortoises are strictly protected in the state of Florida. If you see a tortoise in the natural areas, enjoy the animal from afar but please do not interfere with the tortoise. Never take a tortoise away from the area you find it in, as its burrow should be nearby. Often people will pick them up and try to “save them” by putting the tortoise in their car when they are found crossing a street but in doing so you are removing that animal from its home and creating more problems, not to mention the tortoise will most likely poop in your car. The following are a few examples of the types of wetlands that can be found on UCF’s campus: cypress domes, ephemeral wetlands, seepage wetlands, and freshwater marshes. If you see any bench that is in need of repair, please Create a Work Request page on the Facilities Operations website. There are many beautiful plants and flowers found on the UCF campus. While it is not illegal to pick the flowers, it is better to not pick a flower or plant if you do not know what you are picking. Please do not uproot any plants. Leave nature for others to appreciate! There are volunteer events and hours available to students, staff, and the community. Please visit the Arboretum website for more information. Visit the LNR and the Arboretum website. There is a lot of information on both websites. 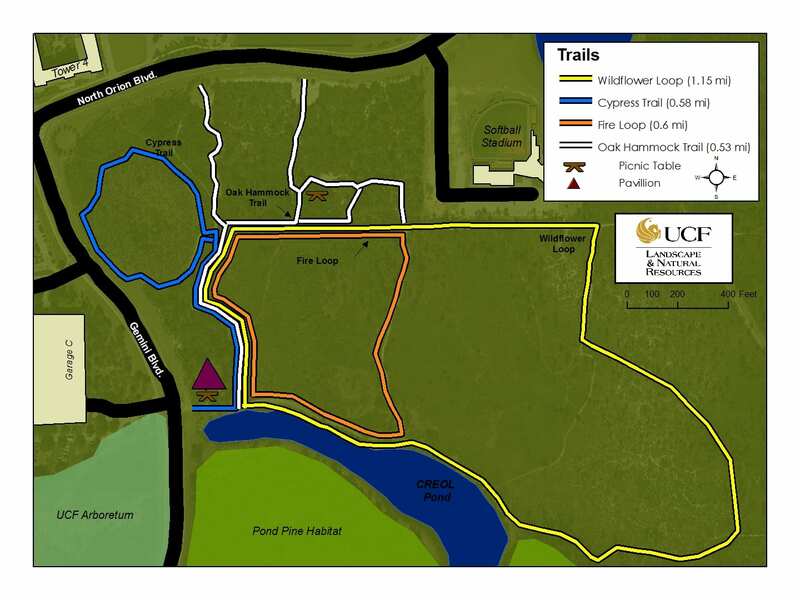 The UCF Land Management Program is responsible for the maintenance and preservation of approximately 500 acres of natural lands on campus, which make up around 40% of the campus acreage. Management techniques used on campus natural lands include prescribed fire, invasive species management, restoration, and species conservation and management. There are five trails total located on campus. Four of them are located in the Arboretum Natural Areas totaling three miles and take visitors through four unique Florida habitats. The Cypress Trail (0.71 miles) encircles a magnificent cypress dome; while adjacent to that the Transition Trail (0.32 miles) winds through the beautiful Oak Hammock. The Fire Loop (0.81 miles) and the Wildflower Loop (1.17 miles) guide our visitors through two different types of flatwoods, pine and scrubby, where both plants and animals can be observed regularly in their natural environments. The fifth trail is the Lake Claire Loop Trail (1.4 miles) which encircles Lake Claire, traveling through transitional wetlands and Scrubby Flatwoods. An AIM work order is required to request the installation of a new bike rack, or suggest maintenance on an existing bike rack. A username and password are required to fill out a work order. This protects the requester by not showing their information, as well as allows the requester to track the progress of the work order. Once the work order is complete, Landscape & Natural Resources will evaluate the request and inform the requester of the final decision. UCF Parking Services have created a handy guide concerning safe biking practices to follow while on and off campus. The Guide can be found here. It is also encouraged to sign up for a free bicycle permit to help keep track and reduce abandoned bikes on campus. You can visit the IFAS website, Orange County extension for help with landscaping. IFAS stands for the Institute of Food and Agricultural Sciences. This website is managed by the University of Florida and is very helpful. You can find information on drought tolerant plants, pest management, gardening techniques and more.